A train on the Market-Frankford Line heads toward Center City from 60th Street. SEPTA offers millions of trips a day. The future of transit in Southeastern Pennsylvania is replete with big plans: New trolleys. A railroad to King of Prussia. Expanded rail service to the suburbs. A lawsuit filed against the Pennsylvania Turnpike Commission, if successful, could not only squash those plans but as early as July threaten basic services that provide millions of trips a day. The suit, filed by associations that represent commercial truckers and drivers, challenges one of the pillars of transportation funding in Pennsylvania, arguing that the state’s use of turnpike toll revenue to support public transportation, established in laws passed in 2007 and 2013, creates an onerous tolling expense for drivers and is unconstitutional. The suit seeks a $6 billion refund from the Turnpike Commission for past tolls collected. The legal dispute highlights the vulnerability of transit funding and has increased the urgency to find other sources of money to support transportation projects. A group of regional public officials and business leaders is convening to consider alternatives. The parties to the lawsuit have been waiting since December for a decision from U.S. District Judge Yvette Kane. The suit’s success would immediately cost the state $450 million a year in transportation funding, but a lack of resolution could be almost as costly. $8 million to $9 million on Amtrak’s Keystone and Pennsylvanian routes, which connect Philadelphia to New York City, Harrisburg, and Pittsburgh. Portions of the revenue also support transportation programs and projects statewide, including disabled and senior services. If the suit is successful, or even if it remains unresolved by July 1, the beginning of the next fiscal year, that money could all disappear. The threat of the suit has prevented the Turnpike Commission from borrowing for almost a year. The state has partially made up the difference since March, but if the case is not resolved by July 1, the Turnpike Commission will remain in limbo, and the state will no longer be able to afford to compensate for its payments. Pasquale T. "Pat" Deon Sr., SEPTA's board chairman and a member of the Pennsylvania Turnpike Commission's board. SEPTA, which relies on the turnpike money for 30 percent of it’s $750 million capital budget, has put on hold 37 projects in purchasing and design stages, and the agency is planning for the worst-case scenario. If the suit is still pending by summer, a likely immediate step would be an end to more than 30 active construction projects, Deon said. These include four major station improvements, disabled-access work, bus purchases, and bridge repairs. Another 25 projects are in an active design stage. Cutting off ongoing work would cause SEPTA to renege on active contracts, which could lead to lawsuits. The union’s current contract through 2021 has a no-layoff clause, said Willie Brown, president of the union representing city transit workers, but he was concerned about becoming understaffed through attrition if SEPTA has a sudden funding drop. SEPTA has contracts with businesses in 40 of Pennsylvania’s counties, totaling $1.3 billion from 2014 to 2018, according to data gathered by the transit agency. SEPTA touts that the five counties it serves generate 41 percent of the state’s economic activity. The two Amtrak lines that could be affected serve 1.7 million customers a year, said agency spokesperson Beth Toll. The state money covers infrastructure improvements, with recent projects including improvements at stations on the Keystone Line to Harrisburg. The lawsuit filed in March 2018 on behalf of commercial truckers argues that Pennsylvania should use toll revenue, currently about $1.2 billion a year, to pay only for expenses related to the turnpike. It also contends that current tolling is so high it impedes interstate commerce. A similar suit in New York state failed, and Deon pointed to a special rule in 1991 federal transportation legislation that authorized use of toll revenue for transportation uses beyond turnpikes. He also argued that boosting public transportation indirectly aids the turnpike. Paul Cullen Sr., a Washington attorney representing the truckers and drivers associations that initiated the suit, has argued the 1991 rule applies specifically to the New York State Thruway or the Fort McHenry Tunnel and is not relevant in Pennsylvania. A funding crisis is not a new experience for SEPTA. The agency for years ran on lean budgets, always at risk of a sudden loss of state money. Despite winning new sources of state revenue in the last 12 years, the agency continues to face a $4.6 billion “state of good repair” backlog. Plans to expand transportation infrastructure consistently run up against the realities of limited funding. Even if the suit is unsuccessful, the state faces a transit crisis. The turnpike is $11 billion in debt because of the borrowing it has done. In 2022, the $450 million yearly payments are scheduled to drop to $50 million. Revenue from a vehicle sales tax is supposed to pick up the slack, but Richards noted that money is already dedicated to other expenses and a fight could ensue. Federal funding, meanwhile, is unreliable. The state needs dedicated revenue that grows with inflation, Richards said, which would create a stable base from which to borrow for long-term projects. Pennsylvania Department of Transportation Secretary Leslie Richards (left) with I-95 portfolio manager Elaine Elbich at the PennDOT office in King of Prussia. “Transit funding in Pennsylvania is still in peril,” she said. Deon is among the people Richards assembled in October to evaluate other funding options. 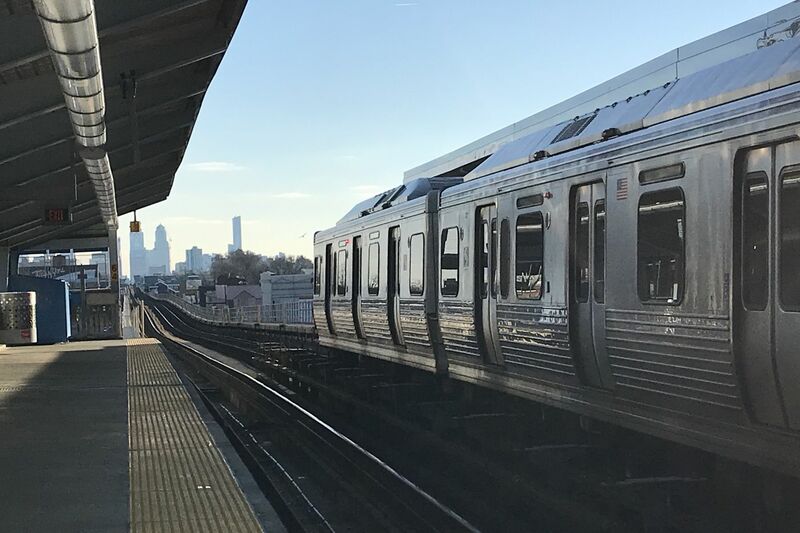 The Southeast Partnership for Mobility, aiming to have transit funding recommendations by May, also includes representatives from big regional employers like Brandywine Realty Trust, Independence Blue Cross, Comcast, and the University of Pennsylvania. A similar committee is dedicated to finding solutions for the western part of the state, Deon said.